A woman holding up a dress as though she had a bedsheet wrapped around her with a take on 'bed he'd' masking her face doesn't make one think of masculine wardrobing However the way that women borrow men's tees, a white shirt or a sweater has been subverted under Maison Martin Margiela so that proportions are inverted - construction details turned inside out to illustrate the extra space of a masculine fit on a woman's body. Underwear that is visible on the ousted holds up dresses as forces that are visible with construction and the skeleton of a garment being a running theme in the collection as darts and seam lines are emphasised in every instant. 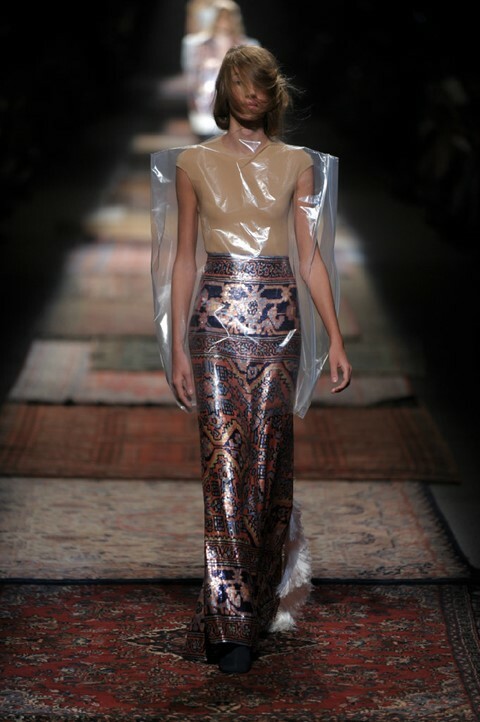 The kerplunk moment came when models came wearing sequinned dresses/capes in a sequinned carpet pattern shrouded in plastic much like the way that real carpets arrive at home. The plastic looked like the type of self-confined cage that makes MMM's clothes so comforting to most (despite the man's departure, those four little stitches still incite much devotion). The carpets are a brief but exciting passage, which then makes way for the humble garment bag being turned into tops and tunics as well as brown elastic bands knitted into 'net' clothes. There's many an element to take away from this Margiela collection and choosing one could be difficult but as soon as they rolled out the sequinned carpets, you knew the lab -coated design team had come up with the goods to carry through Margiela's name and label.